Every “Birthday Party Show” is geared to the age of the children. Age ranges are: 4 to 6, 6 to 8, 8 to 10, and 10 to 12. We recommend you wait until the child is at least 4 years of age for a magic show, unless the guests are older. For children over 12, I would recommend the "Young Adult" Package. During the magic show, the birthday child becomes the magician’s assistant. This makes them the star of the show. Traditionally, we make a special balloon hat for the birthday child with as many balloons as they are old. After the show, the children receive their very own balloon creation to take home with them, as well as some fun promotional gifts. These are some of the packages we offer. Click on them for more information. The magic show for the classic package is about 30 minutes long. 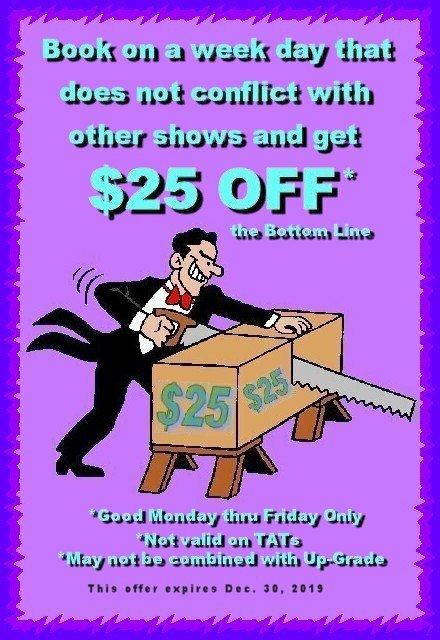 It is a high-energy show designed to get the children excited. During the magic show, the birthday child becomes the magician’s assistant making them the star of the show. Traditionally, we make a special balloon hat for the birthday child with as many balloons as they are old. After the show, children get their very own balloon creations to take home with them. We also give away magic trick instructions, and promotional gifts for the children. Have your birthday party kicked up a notch by adding any of our PACKAGE ENCHANTMENT. To learn more about my secrets for an "Exciting and Memorable Birthday Party" CLICK HERE. The magic show for the Deluxe Package is also high energy, and lasts for approximately 45 action packed minutes. During the magic show, the birthday child becomes the magician’s assistant. We will even do a special illusion by magically either suspending the birthday child in mid air, or making their head vanish from their body. (Some restrictions apply click here). This makes them the star of the show. Traditionally, we make a special balloon hat for the birthday child with as many balloons as they are old. We also provide a "Mr. Luis Magic and Balloon Set" for the birthday child. It is full of exciting easy to learn magic tricks. Some tricks can be performed right out of the package, while others may require some practice first. After the show, all the children get their very own balloon creations to take home with them. You also get some promotional material containing some simple magic trick instructions. We will even lead the children in the birthday song while playing the harmonica. The magic show for the Ultra-Deluxe Package is an other high energy show, and lasts for approximately 55 action packed minutes. It is specifically designed for the child that loves magic. During the magic show, the birthday child will help the magician. We will do Two special illusions with the birthday child. Two illusions in this package! (Some restrictions apply click here). This makes your child the star of the show. They also get a special balloon hat with as many balloons as they are old, and we provide not only a "Mr. Luis Magic and Balloon Set", but also an instructional video on magic tricks they can learn to do at home. After the show, all the children get their very own balloon creations to take home with them. You also get some promotional material containing some simple magic trick instructions. We will even lead the children in the birthday song while playing the harmonica. The magic show for the double deluxe package is an other high energy show, and lasts for approximately 55 action packed minutes. It is specifically designed for "Twins", or if we are celebrating two children's Birthdays. 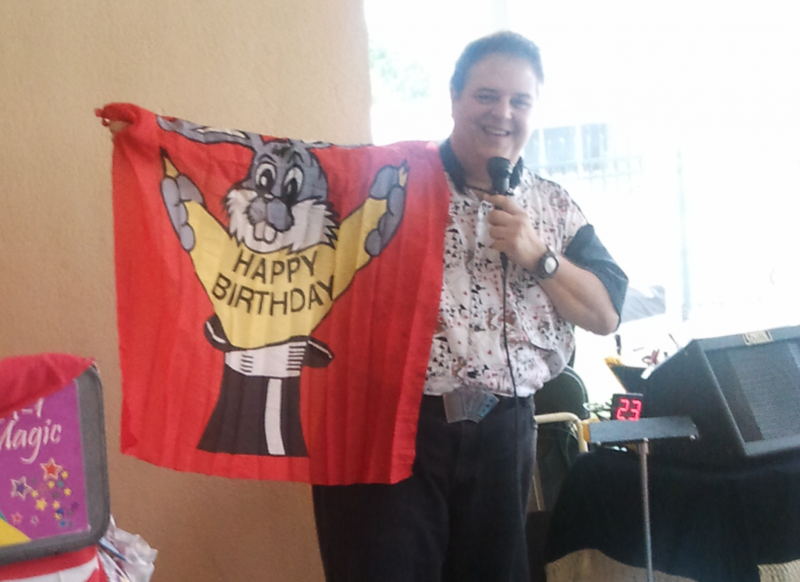 During the magic show, each birthday child will help the magician. We will even do a special illusion with each birthday child. Two illusions in this package! (Some restrictions apply click here). . This makes them the star of the show. They each get a special balloon hat with as many balloons as they are old. 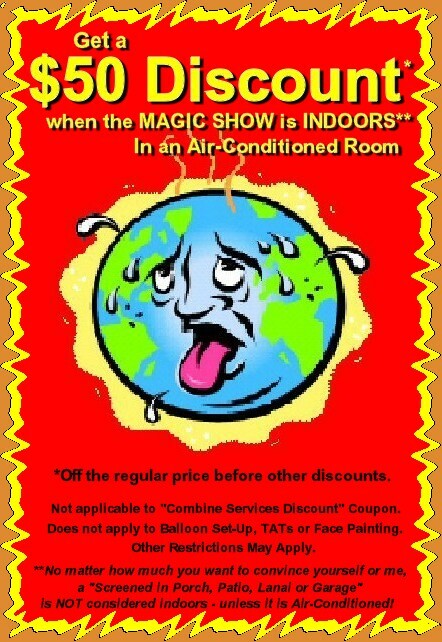 We also provide two (2) "Mr. Luis Magic and Balloon Sets". One for each birthday child. After the show, all the children get their very own balloon creations to take home with them. You also get some promotional material containing some simple magic trick instructions. We will even lead the children in the birthday song while playing the harmonica..
"What can you do for teenagers" you ask? They enjoy magic too! The show we do for 13 to 16 year olds uses more sophisticated material than for the younger children. It challenges their analytical abilities in a fun way. And yes, they also get a humongous balloon hat with as many balloons as they are old! We also do a major illusion with the birthday "young adult" by strapping their neck in a stock and cutting their head off with a jig saw! (Some restrictions apply click here). Fun, Fun, Fun... This package lasts about an hour and includes an instructional video on magic tricks they can learn to do at home. Sometimes, a little goes a long way. If you prefer to have our Temporary Airbrush Face And Body Tattoos as the main entertainment, then that's what you will get. This activity is so popular with the kids, they will have the time of their lives. And it is safe because we use the water based, hypoallergenic makeup paint that washes off with soap and water. In these very difficult economic times, professional party entertainment goes by the wayside simply because it is too expensive. Well now, that doesn't have to be the case. Your child deserves an awesome and memorable birthday party. That is why we have developed a brand new very affordable birthday party package. We are calling it the "Economy Birthday Party Package". 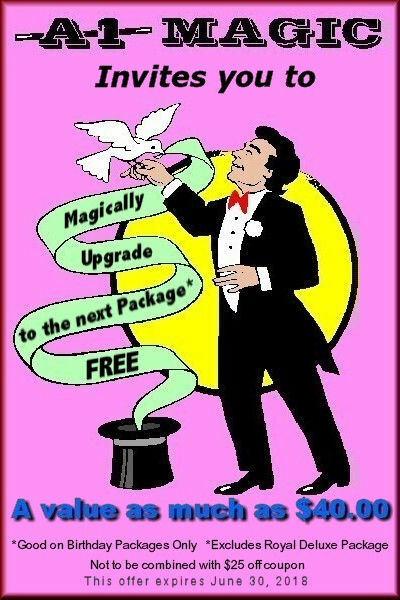 It is a - no frills - no extras - no fluff - Just a "great magic show" package. And we are offering it at a great price too, about $150 less than the regular price of our Deluxe package. Restrictions for "Chair Suspension" levitation. 4) We prefer to perform it indoors or on a solid floor only. Restrictions for Jig saw Illusion. Jig saw illusion not recommended for children under 12 years old. 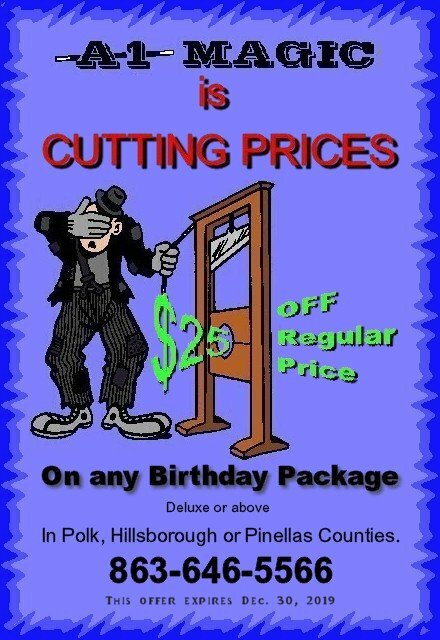 Restrictions for Economy Birthday Party Package. 1) Since this package eliminated the Balloons, Magic Set and/or Magic DVD, any Illusions, Music and we do not bring our PA system, the audience is limited to 15 children. Any more than that the magician might lose his voice or the children will not hear the magician. On the bright side, the magician can be ready to perform 10 minutes after arriving. 2) This package is only for a Childs' birthday and not to be used for other events such as a holiday party. 3) This package also requires full payment deposit if booked at a park. We have lots of fun here. Walking around and mingling with the crowd, Close-Up magic involves lots of audience interaction. The props used are so close to you that you can reach up and touch them. And often you're asked to do so. Props range from the popular deck of playing cards to things like coins, balls and even something borrowed from you like a dollar bill or a finger ring. The illusions are so mystifying, you would not believe it could happen if you did not see it for your self. Balloon gifts are also incorporated to create many magical memories. Lots of fun here too. The birthday adult will help the magician throughout the show. We will make them wear a big balloon hat and even burn up their money! Who would you like to do this to??? The ultimate in party entertainment. Same as the Stand-Up, only MORE of it! We also do an illusion with the Birthday Adult where they may possibly get their head cut off with a Jig Saw! I guess you would say this is a NO BRAINER!! !